It had been more than three years since our expulsion from the Canela village. We prayed for our Canela friends and daily longed to be with them. One Saturday evening as my family and I were sitting down to our evening meal there was a knock on our door. I got up, opened it and there, to my utter astonishment, stood Jaco, our very best Canela translation helper—nearly a thousand kilometres from his village! I was so shocked I didn’t know what to say. “Hamre,” meaning Done or Amen. I opened my eyes and was about to open my mouth to start talking when I noticed Jaco still had his eyes closed. And then he started to pray. That’s when I began to cry. “No, what did He do?” I asked. “He adopted me into His family,” Jaco said, using the same term the Canelas used when one family adopted me as their son, and another adopted my wife as their daughter, and we became true citizens of the Canela village. I looked at Jaco, sitting across the study table from me and I thought, There sits the first Canela citizen of heaven. There had been no missionary, no evangelist or pastor in the village for three years. All there was of God was an early draft printout of a couple of Bible books. But God’s time had finally come. He had begun to build His Church among the Canelas. His questions to me specifically focused on the aspects of God’s character that confused me. For instance, he focused my attention on a passage in Isaiah 60:22 where God promises to do something for Israel after the nation had waited a very long time. 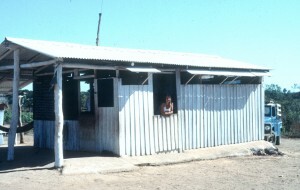 The computer operators and the programmers on the mission centre in Belem, Brazil, heaved a huge sigh of relief when Jack the Jerk and his family finally left on a mini-furlough. They’d had enough Popjes Pressure to last them for the rest of the year. 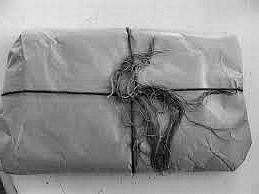 I addressed the parcel to Jaco, our best translation helper, and gave it to a friend who assured me he would give it to the government agent in the village to pass on to Jaco. Several months later, we returned to Brazil and found that Brazil’s anti-missionary policies were still keeping us out of the Canela village. It was another full year before we managed to visit with Jaco in a small Brazilian town outside of Canela land. We were delighted to see him arrive with notes and gifts from Canela friends. One gift parcel looked familiar and I realized it was wrapped in the same paper I had used to wrap the Luke and Acts printout. Opening the parcel was like being punched in the stomach. There was the Scripture printout! Still as clean, new, and unread, as it was when I wrapped it nearly two years before. My answer: God seems to have a schedule, a timetable. He waits until everything is ready, then acts instantly and decisively. God’s character, or “brand” knows nothing of frantic haste or hurry. Rather, He schedules His activities, doing things at the right time in accordance with His agenda. I had heard testimonies of how people had “hit bottom” in their addiction before they saw they needed God. Was it possible that the Canela society simply was not yet ready to turn to God? That the Canelas needed to “hit bottom” before they saw Jesus as their Saviour? I was slowly getting my head around the concept that to God, Sooner is not better than Later, nor is Faster better than Slower, but that there will come a moment when He will act. I felt ashamed as I thought about what a jerk I had been, pushing my coworkers in Belem to work around the clock to get that printout done. I had damaged relationships in my desperate hurry to get God’s Word into the village. Now I realized I had been faster than God! I had forgotten this incident during my confusion, anger, and emotional upheaval leading to depression. Remembering it now helped me to relearn the lesson. God is never in a hurry, but He is always on time. By the way, at the end of Jaco’s visit, he carried those printouts back to the village. About a year later, as he was lying in his hammock, reading them . . . .
A story for next week. I was about five years old when my parents told me what had happened to our country, the Netherlands, when I was a baby. I nodded. I had already seen lots of those enemy soldiers with their guns on the streets, and had heard about them stealing bicycles and radios from people’s houses. I remember times my dad crawled into a space below the floor of a back room and my mom closing the trap door. Then we rolled the carpet back over it and with both of us pushing, moved the heavy sideboard back into place. I brushed out the tracks on the carpet so it looked as if nothing had been moved. Pinning on a poppy in preparation of Remembrance Day, I remember the day Canadian soldiers freed my city. I wrote the memory years ago and read it during a talk at a Remembrance Chapel at the local Christian School on Friday. 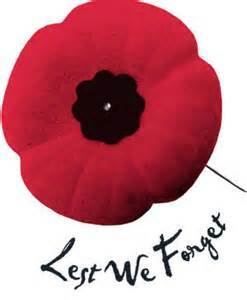 I repeat it here in honour of those who gave their lives in war so that my countrymen and I might live in peace. I squirmed and squeezed my thin seven-year-old body through the jostling crowd until I conquered a spot on the curb. The bright sunshine warmed my face, arms and bare knees as I squinted into the light. I clutched my little paper flag, the Dutch red, white and blue, ready to wave, ready to shout and ready to sing a welcome to our rescuers. It was Tuesday, May 8, 1945. The approaching rumble of a column of Canadian army trucks started the crowd up the road cheering and singing. The noise grew louder as huge, dull green trucks blocked out the sun. Shouting, laughing soldiers waved their machine guns from the backs of the trucks. The applause and cheers of the delirious crowd lining the street nearly drowned out the singing of Wilhelmus, the Dutch national anthem. Young soldiers whistled at the tall blonde girl jumping up and down behind me. Her homemade rose petal perfume fought the stink of the diesel exhaust fumes and the stench of close-pressed sweating bodies—bodies and clothing that had not been touched by soap for years. Camouflaged tanks grumbled past, pulling long-snouted artillery. Their thunderous booming had kept me awake for several nights. Now the cannons were sniffing the air, eager to rout the enemy from the next city. The cheers died down suddenly as a column of prisoners of war in grey-green uniforms shuffled past. The Luger pistol holsters flapped empty on their brown leather belts. They walked with their fingers laced on top of their heads. Armed Canadian soldiers walked alongside them. The crowd silently watched the infantry prisoners go by, but then began to boo and hiss as a small column of Gestapo officers came into view. Finally! No more strutting. No more haughty looks. No more death-dealing commands. Their once-feared black uniforms glistened with the slime of saliva as people rushed from the curb to spit on them. The last trucks in the parade rolled past. I cheered myself hoarse, and waved my little flag until a soldier snatched it out of my hand and waved it high as his truck rumbled on down the road. I tasted the salt of tears, not for the loss of the flag, but for the joy of knowing the Peace Bringers had arrived and the enemy would never make me afraid again. Today, again, I Remember Them. Last week’s episode ended with the depressing news that the door to translating God’s Word for Brazil’s people groups was still closed. Jo and I prayed, (again) and discussed our options. As we talked about staying in Canada, however, we felt an inner uneasiness. It became clear to us that our calling was unique. So we bought our tickets. A month or so later we arrived in Brazil and got settled in our home on the Belem centre. Then, it happened. Within two weeks we got some long awaited news from the government. Wow! The Canelas had been wanting us back since the day we were expelled five years earlier! Within weeks we were back among the Canelas. Day after day, we reconnected with old friends, and mourned with family the death of many elderly Canelas. Our mud-walled, palm thatch roofed house had been torn down, the timbers used for other houses, when government officials had told the Canelas we would not be returning. 24 square metres in which to cook, eat, sleep, and to work together with 3 Canela translation helpers. We lost no time in replacing it. 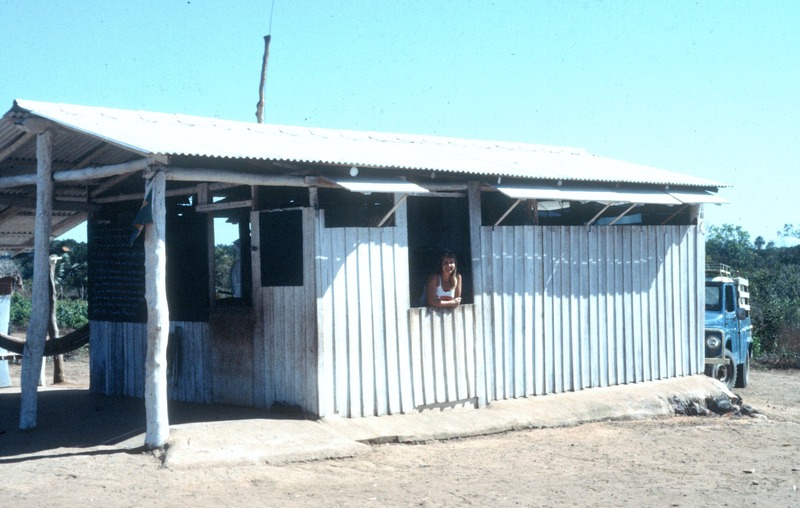 With the help of many Canelas and some colleagues from Belem, we built a two-room, pole frame, wooden shack on a concrete floor, with a pole-rafter, corrugated asbestos roof. A day of sawing and hammering and we had shelves, a bed, a study desk, more work tables and a kitchen counter. A 4X6 metre (13X20 feet), ten-day wonder. Let’s get to work again! Jaco, our best translation helper, was eager to get to started and so were we. That was the beginning of a seven-year sprint to the finish line of a twenty-two-year marathon. We asked the Brazil Wycliffe leadership to excuse us from all administrative work, conferences, and non-translation workshops. We planned no regular furlough, no speaking engagements, or major vacations. We made just three quick trips back to Canada—Jo’s major surgery, Valorie’s graduation, and Leanne’s wedding. Jo and I each focused on translating the Scriptures (1st draft, back-translation, exegetical check, 2nd draft, consultant check, pre-final draft, key-boarding, etc., etc.) for at least ten hours a day, six days a week. During this seven-year sprint, a group of young literate Canelas pled with us to teach them the Bible. Read how God interfered in our rush to finish the translation in these two postings from the fall of 2012. Finally! Handing copies of God’s Word in the Canela language to men & women eager to read it. 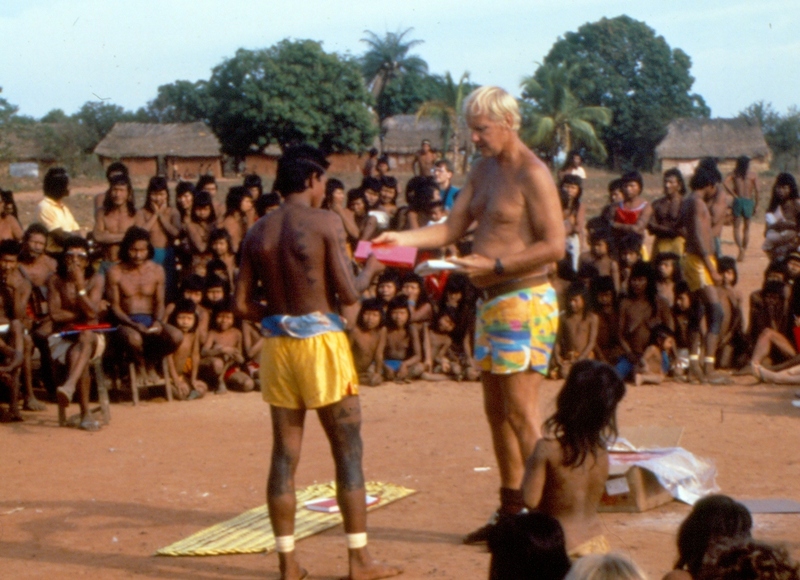 On Friday, August 10, 1990 we finally celebrated the distribution of the Canela Bible! It was the greatest day of our lives. Thirty-three years earlier, Jo and I had started our training in Bible, linguistics and anthropology. 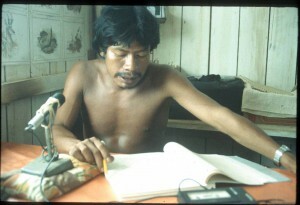 The last twenty-two years had been focused on the Canela translation project. Now our careers as Bible translators with the Canela people had come to a successful end. My parents, and Jo’s mom came to help us celebrate. So did our daughters and their husbands/husbands-to-be. My younger brother and his wife and a number of Wycliffe colleagues also joined us in the Canela village. Over a thousand Canelas gathered in the central village plaza, and we handed out a Canela Bible to readers from every house. A never-to-be-forgotten day! Since then, for a whole generation, the Canelas have had the Scriptures in their own language and as a result, Christ’s church among the Canela continues to grow.